Access to pricing is via passcodes supplied to approved stockists, see section Trade application. Ordering is simple, full access is given to our stocklists, just add your product to basket, click to pay by accepted credit/debit cards or bank tranfer and delivery will be next day providing that we have your order before 3pm* from stock held in our UK warehouse. 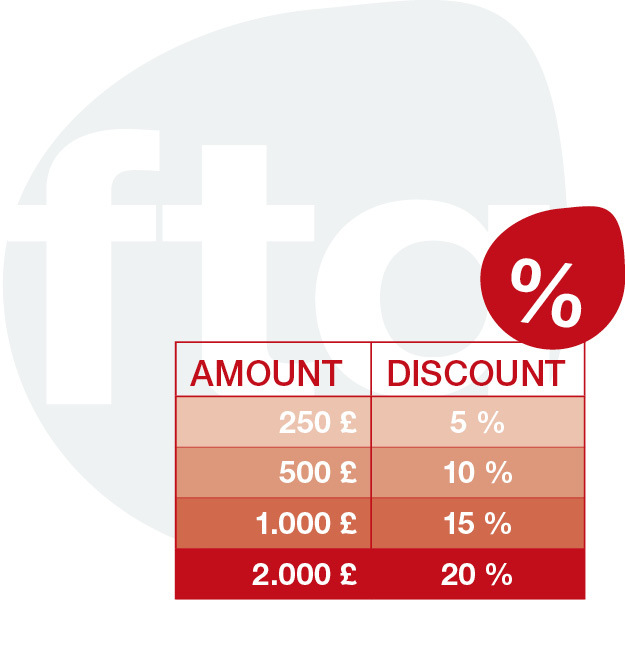 Depending on the size of the order, massive discounts can be achieved. All discounts are automatically put in place as you add products to your basket. You can build order discount with goods for immediate delivery and goods due to arrive in our UK warehouse. All prices shown are in UK sterling and are excluding VAT which will be invoiced at current VAT rate. Our prices include delivery charge for most areas of UK see Delivery Information. Payment accepted by credit/debit cards or bank tranfer. Also special discounted offers will be offered to customers on a regular basis.